David Rudisha covered two laps of Icahn Stadium under his own flowing power. And Mo Farah, he sliced through the eight laps of the indoor mile with his own knife-sharp legs. Galen Rupp crushed the 1500, Silas Kiplagat, Nick Willis, they all propelled themselves very quickly around an oval. But they all had help in the early going from Matt Scherer. Scherer is, or was up until about a week ago, a professional track pacer, one of only a handful of people worldwide who used his speed and finely honed sense of time to help other people run fast. Though he started out as a competitive runner, his resume is filled with other runners' accomplishments. Pacers, or rabbits as they're sometimes called (thus the bunny photo loop on his website), are frequently used in track races of 800 meters and longer to standardize the early laps and facilitate lively competition and fast times. Their job is to accurately lead through the first lap or 600 meters in a very specific time, getting the field off to a good start before stepping off the track, in anonymity. The pacer is a visual embodiment of time. Other runners in the field can easily judge their pace by how close they are to the rabbit. In recent years, almost every middle distance and distance world record was set with the help of a pacer. They're not allowed in World Championship or Olympic competitions, which may account for the few world record performances at those events. While he can accurately click off a 400 to within a couple tenths of a second on the track, Scherer's sense of time pervades his life off the track too: He is acutely aware of passing months and years, the right time to hang back and the right time to move on. 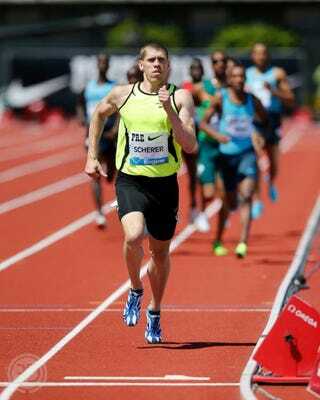 On July 19th, Scherer announced his retirement from pro pacing in a tweet from a track meet in Heusden-Zolder, Belgium. I caught up with him by phone to talk about his former career, and what's next. Coming out of University of Oregon in 2006 with a business degree and a solid mid-distance track background, it sounds like you weren't sold on pursuing competitive running. What made you decide to try it? Professional running wasn't really something I was even looking at. But I ran pretty well at the end of my last year, at PAC 10s and NCAAs. A couple agents approached me after that and things started rolling from there. I actually had a 9-to-5 job lined up, so I had to go back and say I didn't want it. I thought I could take a shot at the 2008 Olympic Trials. I talked to Vin Lananna [Associate Athletic Director at UO] and got some direction, and Nike OTC was starting up that fall in Eugene — everything just kind of came together. When and how did you decide to transition from professional runner to pacer? I made it to the semi-finals of the Olympic Trials in 2008 in the 800. I was only running 1:46 mids which is ok for the US, but not good enough to make any noise on the world stage or get into Diamond League meets. Like any runner, I had paced a few times, to get into a good race or to make some money, and I had done a good job with it. 2010 was my last year as a competitive runner. Few competitive runners commit to full-time pacing because it requires this acceptance that you're not that fast, and that you're not going to improve — was that difficult? I was satisfied with everything I had done in my competitive career. I mean, I'm a realist. It's not that I thought I wouldn't improve, but even if I got better and was able to get in a few more meets, what's that going to do for me? Maybe make me feel better. I was four years out of school; I needed to make some money. I thought pacing would allow me to stay in the track world and see if I could make that work. Are there many professional pacers out there? In terms of a career, are there guidelines, a how-to? I'm not sure about the marathon world, and the only person I know who is strictly a pacer is Heron Lagat in the steeple. Rudisha usually has his own personal pacer… That's about it. There aren't many because most people are in track to win a gold medal. That's not going to happen being a pacer. As far as how to do it, I talked to my agent, Chris Layne. He wasn't sure it was possible either but he thought we should give it a shot. We didn't know anyone else who was pacing professionally. Being a pro runner is selfish — training, racing, strategies are all about what's best for you — and being a pro pacer is almost completely selfless. How did you make that mental transition? It's a different mindset. I treated pacing like a job. I am a competitive person, but I channeled my competitiveness to being the best I possibly could at that job, pacing. The meet director wanted me to hit the time and then get out of the way and let the guys run. I just had a task to do. And I get a lot of satisfaction from seeing other guys do things I couldn't do, and things they thought they might not be able to do. Once I established myself, runners were excited when I showed up because then they felt like they didn't have to think about the first 500 or 600 meters. I got satisfaction from that. How do you get the word out to athletes and race directors that you're available for pacing? It's mostly internal communications between meet directors and agents. My agent sent out a list of athletes along with my name as someone who was available to pace. My first season pacing was indoor 2011. Most of the time, the race director hires me to pace for the entire field. A few times I've paced for one person in the race. Just like the runners, the race director picks up the cost of my travel, hotel and food. Are you paid to hit certain splits? Go a certain distance? What if you don't hit that split — do you forfeit your fee? Yeah, sometimes it's one guy with a lot of accolades who gets to request the pace, but most of the time coaches of the athletes talk to the race director about what splits they want. The race director makes that decision and tells me about it the night before the meet. They ask me to hit this time at 400 and go this far, up to lap-and-a-half in an 800. [Scherer rabbits races between 800 meters and a mile] If I hit the split within half a second, that's acceptable. If the race turns out good, it doesn't matter if you hit the split they requested. Race directors want to put on a good show with fast times. I still get paid even if I don't hit the split because the runners in the field may not feel great. If I see that I have a 10-12 meter lead, I'll slow down to get back into contact. Then maybe I can pull them along again. It's never an issue if we came through slow because sometimes, even if they requested a certain pace, if the runners don't feel good, they're not going to go with me. There's only so much I can do from the front. As a competitive person, you're out in front in a race — did you ever think about staying in and trying to win? It never once crossed my mind to continue. If you're hired as a pacer and it's not in the race director's plan to continue, you may not get that job next year. You pretty much do what you're asked. Are you judged as a pacer by how accurately and consistently you hit splits (your skill), or by the result of the race (the other athletes' skills)? A combination of those two things. I gathered those statistics and made that a point of self-marketing. But yeah, part of that was not in my control. Did you make more as a runner or a pacer? How much did you make in 2013 from pacing [Scherer also got a stipend from Brooks]? I wasn't over that hump as a runner, so I made a lot more money pacing than racing. It's typical for the pacer in a Diamond League meet to make what the third through fifth place runners made. As a runner, I couldn't have even gotten a lane in that meet, and with pacing, getting paid is a sure thing, not just if you're having a good day. In 2013, I probably made about $30,000 between February and September. What's the most difficult thing about pacing? Being consistent. I didn't always know very far in advance what race I'd be doing so I needed to be in shape and ready to go the whole season. I needed to be able run as fast in February as in August. I couldn't really have an off day or down time during that seven or eight months. I didn't need to be in the best shape of my life — the training was not all that difficult. But I was on call from February to September. I'd get a call on Tuesday asking if I could be in Europe to pace on Friday. I didn't train to run 500 meters; I trained harder than I needed to so it made pacing feel easy. I did strength work because I had to be able to pace three times in week. And I couldn't lose fitness when I traveled. A person who was racing would never have that schedule of back-to-back races in different cities, sometimes on different continents, but that's all part of that switch in mindset. It was my job; I accepted it. What was the fastest split you've been asked to hit? The most memorable pacing job? Fastest was 49 flat in an 800. That was when David Rudisha ran 1:41.74 in New York [adidas Grand Prix, 2012]. Most memorable? Oooo ok, there are two. One was in the middle of I don't know how many races within a few days — Asia, US, Europe — I didn't even know what time zone I was in. It was in Hengelo [Netherlands] in 2012 and a lot of people were focused on getting the Olympic A standards. I hit 50.50 exactly [for 400 meters] to a hundredth of second, which is what was requested. Seven people got the A standard in that race. That was really cool. The second was when I paced a Diamond League meet in London in 2013 in front of 60,000 people in the Olympic Stadium. It was surreal. I thought that must be what it felt like to be an Olympian. Tell me about this Freelap timing system. It's a nifty product. It's a sensor you put on the track that automatically splits your watch as you go by so you don't have to hit your watch. It was a good training tool for me, and really accurate, to within a hundredth of a second. You got to travel the world on someone else's dime, you're very successful — why retire? I'm 30 years old. It made a lot of sense this year. I didn't have a real compelling reason to keep doing it, so I thought it was time to move on to the next thing. Even when I was competing, I never wanted to be that athlete who stayed one year too long and started not liking the sport. I didn't want to overstay my welcome. I'm the type of person who's always looking forward to what's coming next. In between pacing over the last six or seven years, I've been doing part-time work for Runnerspace, back end content management mostly. So I'll be working full-time for Runnerspace, doing some of that same thing; we'll figure out exactly what I'll be doing as we go. First though, I'm going to take a vacation. Vacation? Didn't you just get back from Europe? Yeah, I paced three races in six days, so I didn't get to do anything. Normally I would try to stay an extra week in Europe at the end of the season and go backpacking. This time, I'm going to Cabo San Lucas [where there is no track].